Reviving the blog involves a little cleaning up around the place, and I’ve done my best to get everything neat, tidy and up to date. E-mail. Perhaps the most important thing readers should know is that I am trying to keep everything simple from now on by using this e-mail address as the contact point for this blog. The Gmail address previously used for the Volcanism Blog is being terminated at the end of this month, so please update your address books. If you have e-mailed me over the last few months and have not received a reply, please accept my apologies and feel free to contact me again via the address linked above. Links. I have updated the list of links down there on the right, but if anyone finds a link there that is outdated or broken (or would like to suggest an addition – I am always happy to hear about relevant and interesting sites I may have missed) please let me know. Copyright. On legal advice I have slightly amended the Copyright statement and it is now even wordier. The policy remains the same, however, and is very simple: this blog respects copyright, and expects its own copyright to be respected. Comments. Comments on posts are welcome as always, and the comments policy remains unchanged: please be civil and relevant. Comments will be automatically held for moderation if they contain certain words or phrases, or lots of links (this affects very few, however). In order to keep spam down to manageable levels, comments on all posts are set to close after 90 days. I’ve said this before but it remains profoundly true so here it is again: it’s the readers, both old friends and newcomers, who make blogging worthwhile, and I’m very grateful for the appreciation and loyalty the readers of the Volcanism Blog have shown since it began in December 2007, and more than ever over the last year. This blog will re-open for business on 1 March 2012. Sorry for the lengthy intermission. All’s well now. Apologies for the lack of updates at the moment, I’ve been unwell (nothing serious). I’ll be catching up with things as soon as I can. In the meantime, here’s a nice painting of Vesuvius from 1797 to enjoy: Giovanni Battista Lusieri, ‘Vesuvius from Posillipo by Night, during the Eruption of 1787’. The Volcanism Blog is taking a short summer break this week and will be back on Monday 4 July. Until then, for all things volcanic Eruptions is your place, as ever. Posted by admin in admin, personal. It’s been far too long. A heartfelt thank you to everyone for your kind and supportive comments following my bereavement, both here on the blog and in personal messages. 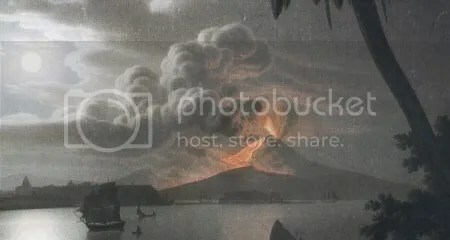 The Volcanism Blog will re-open next week, on Thursday 2 June 2011. Some would take this opportunity for a big relaunch with everything redesigned, fancy graphics and lots of new bells and whistles. Don’t worry, though, that is not going to happen here. Just a return, at last, to something like normal. And perhaps the current eruption of Grímsvötn (justly described as ‘a doozy‘ by Erik Klemetti; more brilliant coverage from Eruptions here) will keep going into next week, and bring us the Return of the Monster Icelandic Ash Cloud Horror that the media, particularly in Britain, is obviously longing for. We’ll see. Very sorry for that unannounced break, which was due to a combination of unfortunate circumstances. Things are better now, mostly, and normal service will be resumed with immediate effect. Anno 2010 has been a rather patchy year for this blog and its owner, full of ups and downs (rather too many downs), but 2011 looks much brighter. Thank you for your patience. UPDATE 21 December 2010. It’s taking a little longer than I hoped to get things straight, and now the Christmas holidays are upon us (see above our usual Christmas picture above of Crater Navidad, Lonquimay volcano, Chile); so to be on the safe side I’ll say, this blog will be back in action from 1 January 2011. Thank you all for your kind and supportive comments, both in reply to this post and by e-mail, it is much appreciated. Happy holidays to everyone, see you in the New Year! I’ve been away in the wilderness and intended to use a wireless connection to keep up with blogging, but the system available turned out not to be up to the job. Additionally, some posts which I thought I had managed to get onto the blog seem not to have appeared. All quite annoying, particularly when there has been so much volcanic action over the past few days. Well, I will sort out the mess and get back to you — apologies for the disruption. The Volcanism Blog is taking a short break: away today and tomorrow, back on Wednesday 6 October.